"Partial Laminations" are becoming more popular in production at CPC Label. This process of partially laminating a label is becoming quite popular with our customers in particular industries. 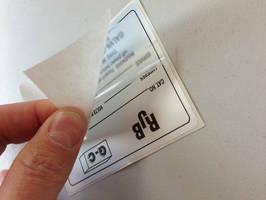 What this process does is to allow the end user to imprint the necessary variable information themselves before removing the tab and covering over that information with the clear film. In most cases we would do all the variable printing in advance and laminate over top as part of the production, but more and more it seems some of our good customers need the flexibility to imprint their own info. We’re glad we can help! CPC Label is a 40 year old (UL Recognized) supplier of custom printed items such as Labels, Rigid Nameplates, Lexan/Polycarbonates, Tags, and Forms. Consolidated Products Company (CPC) is headquarted in Linwood, New Jersey. We are THE source for all your custom printing needs. We are printing specialists. We have been a UL Recognized Supplier for over 30 years and we work very hard to maintain our knowledge of standards across many different UL Listed Industries.